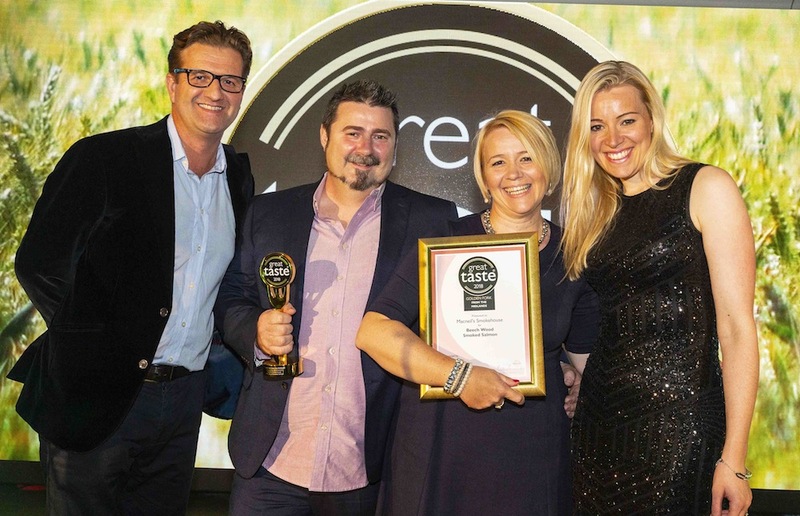 Great Taste awards Midlands family firm with prestigious award. Celebrating the very best in food and drink, Great Taste, the world’s most coveted food awards, has reached its grand finale for 2018. 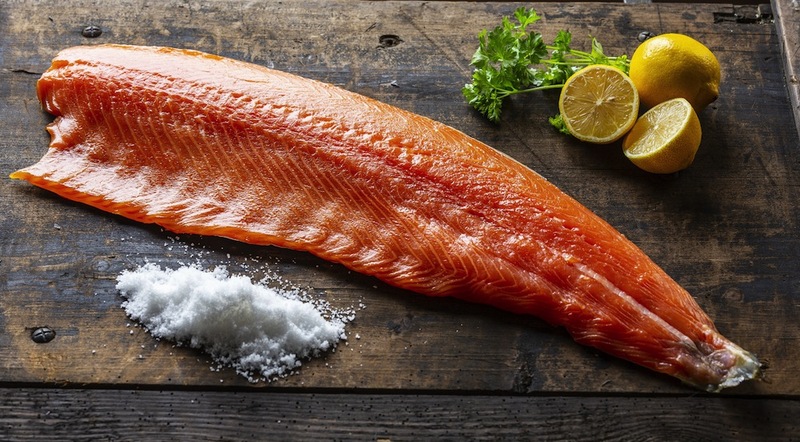 The Great Taste Golden Fork for the best food or drink from the Midlands was presented to Macneil’s Smokehouse from Droitwich, Worcestershire for its Macneil’s Beech Wood Smoked Salmon. Cured and then smoked in a vintage Norwegian smoker, this salmon “melts in the mouth but has a residual bite”. “Its gorgeous texture dances on the tongue in tango with the perfect smoke”, resulting in a very moreish mouthful. Sliced Scandinavian style, the Beech Wood Smoked Salmon “exudes finesse with an even cure, clean saline notes and a buttery texture”. Out of a record breaking 12,634 products entered into Great Taste 2018, the ‘well fit’ Beech Wood Smoked Salmon, which was inspired by producer, Tony Macneil’s time working as a chef in Norway, was celebrated as the best tasting product in its region at the Great Taste Golden Fork Dinner held on Sunday 2 September at the InterContinental Park Lane Hotel, London, where over 350 guests from the world of fine food gathered to hear the results of many months of rigorous judging. Also nominated for this year’s Golden Fork from the Midlands was a Great Taste 3-star winning British Cassis, produced in Kington, and a Honeyed Fig Relish with Black Garlic made by Derby-based The Quirky Cook. Main photo: (L to R) John Farrand, Guild of Fine Food, Tony and Bee Macneil of Macneil’s Smokehouses and Julie Mills from Westmorland Family. Great Taste, founded in 1994 and organised by the Guild of Fine Food, has judged over 134,000 products in the last 24 years; each one has been blind-tasted by a team of judges who are dedicated to finding the most exquisite tasting food and drink regardless of branding or packaging. The panel of judges this year included; MasterChef 2018 champion, Kenny Tutt, chef and food writer, Elly Curshen, eco chef and food writer, Tom Hunt, author and chef, Zoe Adjonyoh, baker Tom Herbert, author and blogger, Izy Hossack, and baker and recipe writer, Martha Collison, as well as food buyers from Harrods, Selfridges and Sourced Market. These esteemed palates have together tasted and re-judged the 3-star winners to finally agree on the Golden Fork Trophy winners and the Great Taste 2018 Supreme Champion. Each team of four judges blind-tastes around 25 products per session, discussing each product as a coordinating food writer transcribes their comments directly onto the Great Taste website which producers access after judging is completed. Over the years, numerous food businesses, start-ups and well-established producers have been advised how to modify their foods and have subsequently gone on to achieve Great Taste stars. Food or drink that is deemed worthy of Great Taste stars is also tasted by a team of arbitrators, who taste, confer and agree on the final award given. If judges feel that a product needs some adjustment, and is therefore not likely to receive an award, the food or drink gets a second chance on a referral table, where another team blind-tastes and deliberates. For a Great Taste 3-star award, the vast majority in the room – which can be as many as 30-40 experts – must agree that the food or drink delivers that indescribable ‘wow’ factor. What do the stars mean for producers? Recognised as a reliable stamp of excellence among consumers, retailers and major food buyers alike, Great Taste success can be the gateway to exciting opportunities for food and drink producers. As well as seeing an uplift in sales and revenue, award-winning producers also get to enjoy raised awareness by appearing in the Great Taste book, a unique directory used by many food retailers, supplying samples for high profile events and exhibiting as part of Great Taste Markets at events including RHS Hampton Court Flower Show, CarFest and Countryfile Live. Receiving a 3-, 2- or 1-star rating for products really puts producers on the map, while opening doors to investment and export opportunities. What should consumers look for? The logo. The Great Taste symbol is their guarantee a product has been through a rigorous and independent judging process. It’s not about smart packaging or clever marketing – it’s all about taste.